Nursing what was initially thought to be a sinus infection, the driver of the No. 11 Toyota Camry was forced to sit out Sunday’s NASCAR race in Fontana, Calif. for what turned out to be a sliver of metal in his eye that impacted his vision. Hamlin met the media today at Martinsville Speedway and explained the timeline of events last weekend. In between, he vented at critics who questioned why he didn’t race on Sunday. In the process, he proclaimed himself the favorite to win this weekend’s STP 500. “I literally thought on Friday that I was starting to get a sty,” said Hamlin, who finally determined that a small piece of metal flew into his eye during practice on Friday at the two-mile oval. So it was back to the infield care center for further analysis. After two physicians on-site were unable to pinpoint the issue with his ailing eye, they recommended that he see an optometrist. But with the start of the race fast approaching, there was no time for him to be examined off-site and make it back for the start. Taking into consideration his slightly impaired vision, NASCAR president Mike Helton finally made the call to tell Hamlin to step aside. The lone consolation was the fact that with NASCAR’s new format to qualify for the Chase (a win virtually assures a berth in NASCAR’s playoff), he is still in title contention. And that is precisely what Hamlin plans on doing. The other piece of unfinished business was addressing the critics who started spreading vicious rumors over why he didn’t race on Sunday in Fontana. “What if it was cancer or a tumor? I don’t have to tell people that. 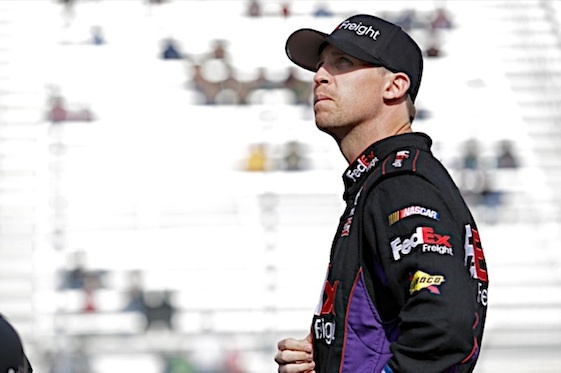 It’s my business,” Hamlin said. “And there are people who think we sidestep a drug test. I’d have to be an absolute moron to risk that. For a man who is just shy of turning 34 you would think he would know better, but time and time again, his mouth proves what a immature, egotistical person he really is. Do yourself a favor and keep your rantings confined to your bathroom mirror. This whole episode was handled badly by all and from a fans perspective did not make a lick of sense and still doesn’t.